Gov. Greg Abbott on Thursday expressed caution about high-speed rail in Texas, warning that any investment in transportation must not be a "money-losing proposition." WACO — Gov. Greg Abbott on Thursday expressed caution about high-speed rail in Texas, warning that any investment in transportation must not be a "money-losing proposition." "Because of the price of oil, we’re dealing with a little bit tighter budget, and so we just need to be responsible budget-wise," Abbott said. "Even though we are at a tighter budget ... we still want to work on cutting the margins tax even more. We need to find ways to reduce property taxes, about we've heard plenty of complaints." Last week, Comptroller Glenn Hegar projected that lawmakers would have $1 billon less to work with next session because of the faltering oil and gas industry. State leaders, including Lt. Gov. Dan Patrick and House Speaker Joe Straus, have also promised to look at providing tax relief despite the uncertain outlook. The margins tax for businesses, meanwhile, was a target of lawmakers during the 2015 session, when they cut it by 25 percent. "It is important to be able to invest in anything that works, but when you invest, you don't want to lose money," Abbott said, bringing up a high-speed rail project in California that ended up costing much more than originally projected. "You've got to proceed with caution." Abbott instead pointed to the freight shuttle system recently unveiled at Texas A&M University, which would move containers on elevated highways using automated transporters. Abbott noted that the system does not rely on taxpayer dollars and would "not involve taking anyone's property." “You have to look at certain issues so that it works for all the different pieces of all the different constituencies, but most importantly look at at the bottom for the taxpayers in Texas, which is the thing that we have to be the greatest guardian of," Abbott said. In the Q-and-A, Abbott also weighed in on the state's economic incentive programs, opposed by some conservatives as corporate welfare. 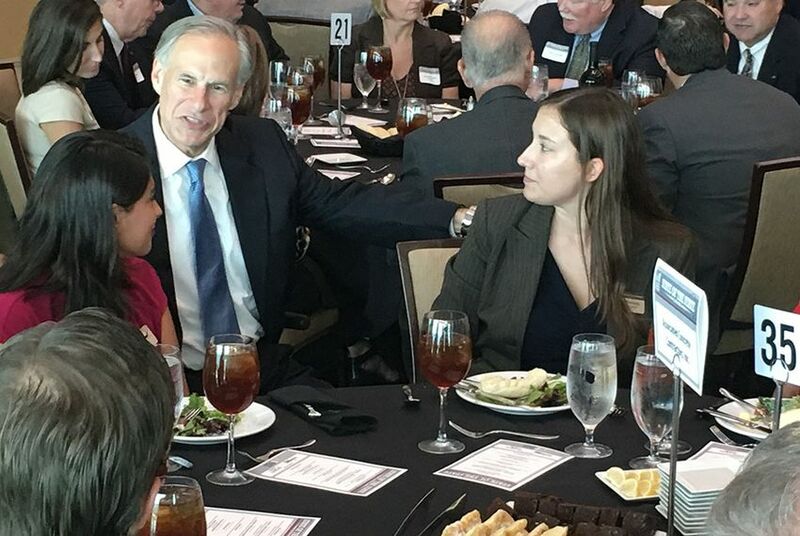 Abbott touted how he led the charge to eliminate the Emerging Technology Fund last year — using half the leftover money to set up a university research initiative — but argued that Texas still needs the Texas Enterprise Fund, which the state uses to seal the deal with businesses interested in relocating to Texas. “We do need it refunded," Abbott said, turning to state Sen. Brian Birdwell in the audience. "Senator, I'm asking for help. This is important to the people of Waco. Let’s hear a big round of applause if we want the Enterprise Fund refunded the next legislative session!" "This is our deal-closing fund," Abbott later said. "While Texas has a pro-business climate, "there are some times when the state of Texas is kind of on par in that regard with some other states. And so a business will say, 'Listen, it comes down to you and some other state. If you can provide this incentive, it will be Texas.' And we provide that incentive, and it becomes Texas." Asked what he would like to see the Legislature accomplish in 2017, Abbott cited not only tax relief but also progress on early education and higher education. He also said lawmakers should focus on the state's troubled foster care system, whose current state he called "completely unacceptable."